All things considered, it could have been worse. The S&P 500 could have closed at Wednesday’s low of 2,781.81, logging a 1% loss for the session, quelling any hopes for a rebound built on Monday’s big bounce. But the market snapped back at mid-day, closing the gap to a loss of only 0.03% yesterday. Nevertheless, it was anything but the bullish follow-through many investors were hoping for. Advanced Micro Devices (NASDAQ:AMD) may have been the biggest drag. It was off to the tune of 3.1% as traders continue to grapple with recent bullishness that may or may not be fully merited. At the other end of the spectrum, Alcoa (NYSE:AA) was up 1.4% during normal trading hours and up considerably more in after-hours action in response to a solid third-quarter print and an outlook that was just as compelling. There just weren’t enough stories like Alcoa’s to lift the overall market all the way into the black. Headed into Thursday’s session, the stock charts of Wells Fargo (NYSE:WFC), CSX (NASDAQ:CSX) and Macy’s (NYSE:M) merit the most attention. Each are names that have been put under the trading microscope of late, but they’ve all just dropped another big hint. Wells Fargo was in focus just a few days ago, after seeing two consecutive days of reversal clues. Namely, WFC had logged two days’ worth of doji bars, which tend to take shape as a net-selling environment transitions into a net-buying environment. That happened. But, that’s not the most compelling part of the story here. It’s what happened in the meantime that truly seals the deal. The last likely technical ceiling was hurdled thanks to Wednesday’s 1.7% advance. • The resistance line in question is $54, plotted with a white dashed line on the daily chart. That’s where the stock had peaked a few times in the previous week. • The key driver for this turnaround may have actually been a revisit of the long-term support line plotted on the weekly chart. Wells Fargo shares were stochastically oversold at the time, and this isn’t a stock that remains oversold for long. • If WFC can get over the convergence of moving average lines around $56, the next-best target is the $59.50 area, where the stock found a ceiling in August. 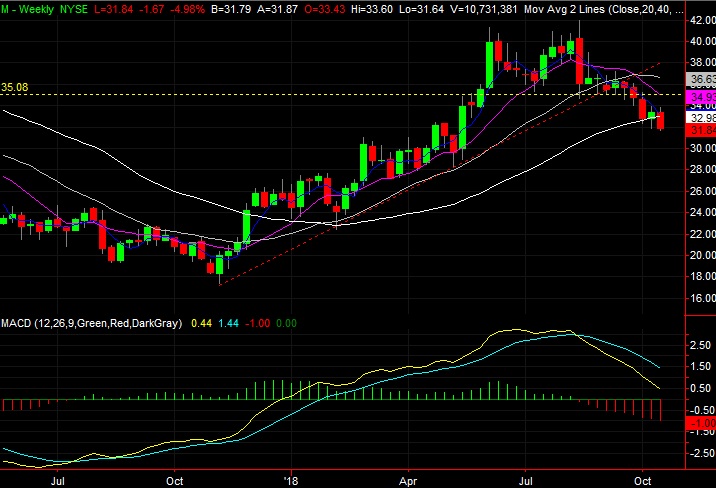 A week ago, CSX looked like it was in serious trouble, having just broken below its gray 100-day moving average line. Two days later, it looked like it was back on track by virtue of being back above that key moving average line. Now that rebound is back in question, as the stock fell 2% again on Wednesday. The end of the selloff? The 100-day moving average line. The stock’s boundaries have been established. 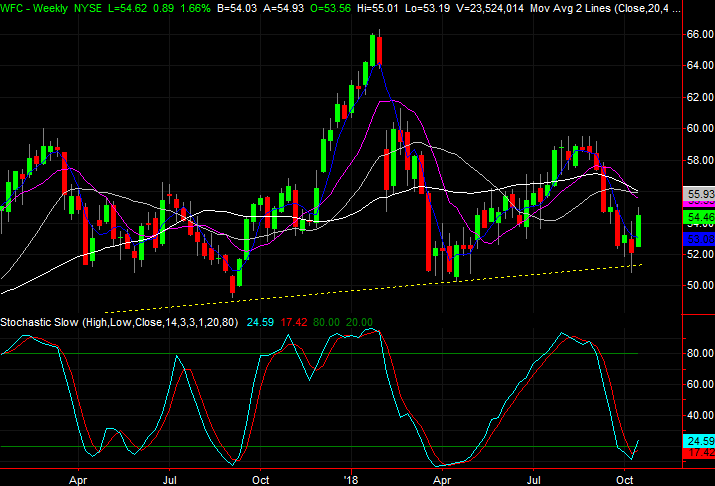 Now comes the waiting game, to see whether it’s the floor or ceiling that breaks first for CSX. A few too many hints suggest it’s the floor that’s ultimately going to break here, allowing CSX to finally move into a free-fall. • Wednesday’s open right at the 20-day moving average line, plotted in blue, suspiciously didn’t take long to turn into a profit-taking. The sellers never really looked back until they had to at the 100-day line. • Although still on the fence, notice how strong last week’s selling volume was, and how strong Wednesday’s selling volume was. Conversely, the three bullish days in between were all light-volume days. It’s a sign there are more sellers than buyers. 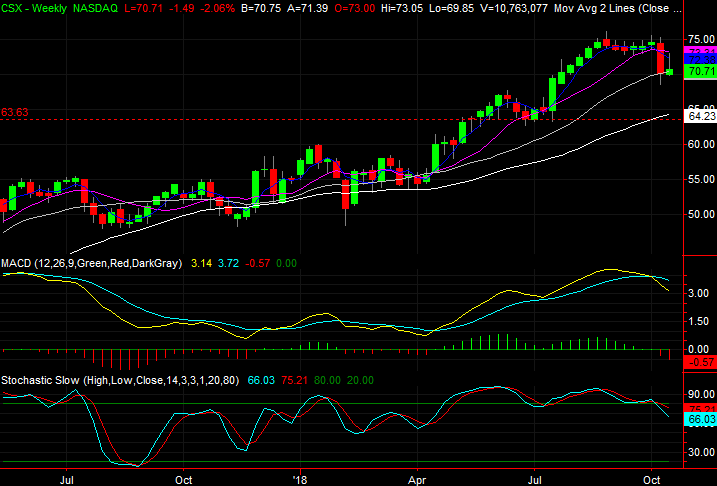 • The weekly chart makes clear how overextended CSX is, and how ripe it is for profit-taking. Should the 100-day average fail to hold up as a floor, the next floor is around $64. Finally, the last time Macy’s was dissected was on Sept. 18, when shares were toying with a break below a support line around $35.00. That line is plotted in yellow on both stock charts. That ended up happening, almost the next day. But, almost as if scripted the next likely technical support level also slowed the sellers down. That’s the 200-day moving average line, plotted in white. That floor looks like it’s finally snapped as well… and rather decisively. • Macy’s shares actually broke under the 200-day average line, which briefly acted as support, last week. That move didn’t stick though, allowing the stock back above it since then to let M test the blue 20-day moving average line one last time. Unable to get back above that level, traders finally threw in the towel yesterday, driving the stock to a new multiweek low and multi-week low close. • Much like CSX, the bearish volume before and after the recent rebound effort was much greater than the volume seen with the short-lived rebound effort itself. • Zooming out to the weekly chart we can see just how much ground there is to give up after the big rally from earlier this year, and how well-developed the current downtrend is. The post 3 Stock Charts for Thursday: Wells Fargo, CSX and Macy’s appeared first on InvestorPlace.